This material, developed in Canada, is in service worldwide. Since receiving BYTE Magazine’s “Product of the Year Award” in 1985 it has been mentioned many times in their articles, and also in a number of other publications. It is the only material of its type available anywhere! One point is of critical importance: Stabilant 22 is not “just another contact cleaner.” It is an initially non-conductive long-chain organic block polymer that switches to a conductive state only when used in a thin film within the interstices of a contact pair. It remains non-conductive on the insulating surface between adjacent contacts. Thus, by remaining resident within the contacts, it improves connector reliability within a contact set without causing signal leakage problems between adjacent contacts. Its advantage lies not in making new contacts better, but in keeping contacts operating as if they were new, while making old contacts function perfectly despite the ravages of time and adverse environments. In simple terms, Stabilant 22 provides the reliability of a soldered joint without producing a mechanical bond. It also exhibits excellent lubricating properties, but does not creep; it is exceptionally stable, and has a very low vapor pressure. Its continued regular use will enhance contact reliability for many years. — to mention but a few of its many applications! Because of its high reliability and low toxicity, Stabilant 22 has been used extensively as a one-shot, environmentally friendly alternative to repetitive-cleaning treatments. In fact, Stabilant can be useful anywhere connectors and (non-arcing) switches are employed. When used in audio applications, Stabilant 22 literally cleans up the sound by reducing distortion from oxidized and corroded contacts, which often coarsen the reproduced sound. The same is true of a transmitted video signal, whether its source is from a cable or a VCR/DVD’s output connectors. Unlike many “cosmetic treatments,” which assume that a clean-looking connection should work perfectly, Stabilant 22 does more by making “clean” contacts more efficient conductors. It rejuvenates older contacts by eliminating thin-film rectification effects, which produce so-called *electronic smog” or “ghosting” due to RF interference. These encourage signal reflections, and often make the signal noisy. Stabilant 22 works from DC to several GHz. It comes in a dropper bottle, which permits a large number of contacts to be treated very quickly. In a typical home audio system, it can be applied to everything from moving-coil cartridges to loudspeaker terminals. This also applies to normal RF connections, as well as to the video cables used in home theater or projection systems. When applied to either coaxial or twin-lead antennas, it acts to increase the signal-to-noise ratio. This is even more dramatic when it is applied to the leads from a satellite dish, where it connects to the microwave flange. Stabilant 22 eliminates the leakage that exposes this junction to outside interference, preserving the function of the low-thermal-noise preamplifier. When combined with the other important considerations, such as careful site preparation, Stabilant 22 can make an engineer’s task much easier! An example of connector-intensive usage can be found in most recording studios. There are hundreds of contacts involved: audio jack panels, XLRs, card-edge contacts, interconnecting cables, and ICs. When Stabilant 22 is applied it can reduce high-order distortion in complex interconnections, removing the “glassiness” which frequently plagues both recording and re-recording sessions. Stabilant 22 is obviously a very useful material, not only in home entertainment setups but wherever a problem occurs in any signal-carrying lead. Many people have taken to applying a drop of Stabilant 22 whenever they encounter a contact problem anywhere in their home or in their business. Supplied as a concentrate, it can be diluted to ease insertion into confined spaces. After a year’s use, Stabilant 22 may need to be reapplied. If repeated making-and-breaking of the contact surfaces occurs regularly, it may be advisable to reschedule additional applications for every few months. Stabilant 22 is an electrically active material which stays resident within a contact-pair, there enhancing conductivity without causing electrical leakage between adjacent contacts. Although Stabilant 22 does have a detergent action it is not sold as a cleaner, just as it has a good lubricant action but is not sold as a lubricant. Stabilant 22 is used to increase the reliability of contacts. Tenfold to one hundred-fold increases are not unusual. At the present time it is used in many different types of contacts, including card-edge connectors, D-type connectors, MIL-spec connectors, signal switches, etc. Stabilant 22 is an initially non-conductive amorphous-semiconductive polyoxyethylene-polyoxypropyline block polymer with a molecular weight of about 2800 that, when used in thin films between contacts, acts under the influence of the electrical field and switches to a conductive state. The electric field gradient at which this occurs is established during manufacture so that the material will remain normally non-conductive. Its switching speed is too slow to allow it to be used in the more traditional semiconductor applications; however, this means that signals at frequencies substantially above five cycles per hour will not be modulated by the switching characteristics of Stabilant 22. Thus, when applied to electromechanical contacts, Stabilant 22 provides the wide-bandpass connection reliability of a soldered joint without bonding the contacting surfaces together! In its undiluted form at room temperature, Stabilant 22 has the viscosity of medium-weight motor oil, although it thins out with increasing temperature, starting to decompose into the two polymers it is formed from at about 240° Celsius. It has a very low vapor pressure and therefore there is no appreciable loss of material from evaporation. It has been in some applications for more than fifteen years without renewal, and it is probably safe to say that in the majority of cases, the equipment on which it is used will be retired as obsolescent before the Stabilant must be renewed. Stabilant 22 is used in electronics where equipment failure can cost lives: equipment such as biomedical electronics in hospitals, and aircraft navigation and instrument landing systems. In one test we performed in public at trade shows, we ran a computer mother-board immersed in a clear plexiglass case, partially filled with Stabilant 22. This demonstration was quite effective in dispelling any doubts about the material potentially short-circuiting adjacent contacts. Because of Stabilant's exceptionally long shelf life and proven effectiveness in the prevention of system malfunctions, many more manufacturers are now specifying the use of this material in preventive maintenance programs. Stabilant 22 is being used to solve, as well as prevent, problems in such diverse fields as pulp and paper mills, oil fields, mining, railway operations, diving, marine electronics, and air-traffic control. No, it has very low external toxicity although ingestion should be avoided. No skin reactions have ever been observed, and undiluted Stabilant 22 is of low flammability. In the United States, Stabilant 22 is not subject to the Toxic Substance Control Act (TSCA), nor is it reportable under SARA Title III. In what form is Stabilant 22 most useful? Stabilant 22 is packaged in 5 ml and 15 ml quantities. The 5 ml "Field Kit" includes several applicator brushes and a 15 ml empty bottle for dilution with Isopropyl or Ethyl alcohol, if desired. Obviously, it is the concentrate that remains after the alcohol has evaporated that accomplishes the job. The alcohol is there just as a solvent to "carry" the concentrate into place. By diluting it, Stabilant can be applied to socketed ICs without removing them from their sockets. 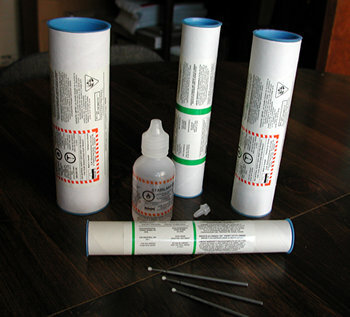 The concentrate, on the other hand, is often used as an insertion aid when inserting multiple-pin ICs into their sockets because of its lubricating properties. Just how much should be used? Normally, a film thickness of about 0.5 to 1 ml of the concentrate is more than enough. In other words, you want just enough to fill up the minute gaps within the contacts. When Stabilant 22 is used in diluted form, be sure to allow for the evaporation of the alcohol which forms 4/5ths of the volume. *Per your request, packets of mini-brushes can be included at no extra cost. For more information, please see the Stabilant Web site listing of Technical Notes.